Wall Street Survivor is home of the web’s best Stock Market Simulation. With an intuitive design and easy to understand layout, trading has never been this easy. It caters to beginners and seasoned traders alike. The platform allows users to jump right in and start using the various resources and tools. Research tools are built in and supported by many educational resources. I would recommend the platform for users of any kind. People who are using it on their own will find it the most beneficial. Wall Street Survivor makes learning about investing simple, enjoyable and rewarding. Wall Street Survivor offers top-notch teaching resources that anyone can understand. It uses investing and personal finance courses, tutorial videos and hundreds of articles. Courses reinforce this learning. Students can see class rankings. All trading is performed in real-time to prevent cheating. Students can practice their skills by taking online quizzes. Playing the interactive stock market game reinforces the lessons. Professors are also given a myriad of resources. These include class reports and lesson plans. It can even assign readings for students to complete. All of the features are integrated into the simulation. These features make up for the platform’s lack of a set of assignments. The lack of this resource is the only reason that I haven’t awarded it a perfect score in this category. 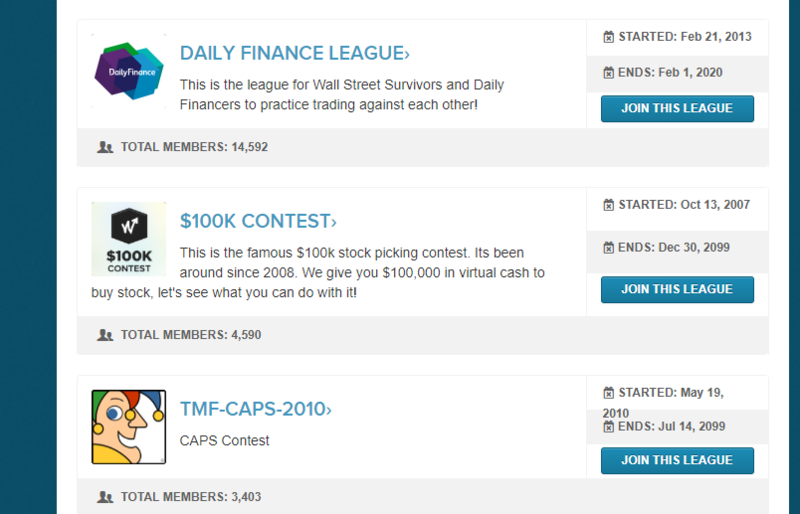 Wall Street Survivor gives users the option to create their own custom class leagues. Individuals have the flexibility to change the rules as they please. Additional settings such as portfolio currency can also be configured. The whole process takes less than five minutes. Users can easily invite their friends by sending them the link to the league. With professional analytics built in, individuals have a robust trading platform. It includes useful research tools such as historical prices, SEC filings, and research. Users can also compete in public leagues for real cash prizes and awards. Unlike other platforms, Wall Street Survivor offers dozens of courses. They are designed to help traders learn and improve their skills. These courses are integrated into the simulation, allowing users to practice their skills. Registering an account is straightforward, with minimal information required. Users have the option of signing up with their Facebook account. This option further simplifies the process. The simulation offered by Wall Street Survivor is top of the line and the best I have ever seen. With an efficient User Interface, trading is almost effortless, even for beginners. Stocks can for using their tickers or by searching the company name. The trading page includes company names and logos. This ensures that users see the right stock. Colorful charts display how each stock’s price moves. Best of all, they also offer a live chat support desk for any queries that users may have.